The Auto-Owners Insurance Win One + Give One Sweepstakes is open to legal residents of Alabama, Arizona, Arkansas, Colorado, Florida, Georgia, Idaho, Illinois, Indiana, Iowa, Kansas, Kentucky, Michigan, Minnesota, Missouri, Nebraska, North Carolina, North Dakota, Ohio, Pennsylvania, South Carolina, South Dakota, Tennessee, Utah, Virginia, and Wisconsin, who are 18 years of age or older (19 in Alabama and Nebraska). 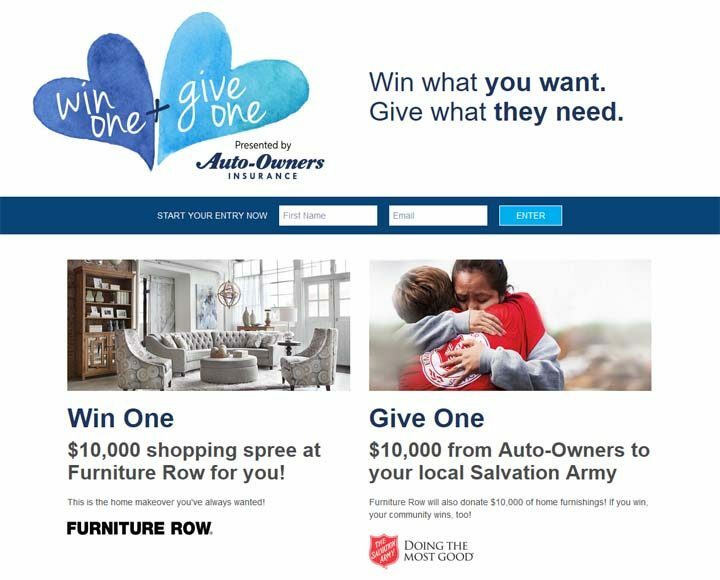 The Auto-Owners Insurance Win One + Give One Sweepstakes ends on October 15 at 11:59:59 p.m. CT.
During the period, visit autoownerswinonegiveone.com and follow the on-screen directions to complete and submit the online entry form. One (1) Grand Prize: A Furniture Row/Denver Mattress shopping spree awarded in the form of a $10,000 gift certificate ARV: $10,000. Additionally, the Sponsor will award a $10,000 Furniture Row gift certificate to the Salvation Army location closest to where the winner resides. The Sponsor will also donate a $10,000 check to the Salvation Army closest to where the winner resides to be used in the community as solely determined by Salvation Army. Fifty (50) First Prizes: An Auto-Owners Insurance #78 Team Die-Cast Car by Lionel Racing (1:24) autographed by Martin Truex Jr. ARV: $69.99 each. One Hundred Fifty (150) Second Prizes: An Auto-Owners Insurance #78 Team Prize Pack which includes a t-shirt (size Large) and a hat. ARV: $59.98 each. Two Hundred Fifty (250) Third Prizes: A Toyota Racing Prize Pack which includes a Toyota Racing NASCAR Delphi Cap, a Thermos Hydration Bottle, and a Paddle Bottle Opener. ARV: $46.40 each. Total maximum value ARV of all prizes in the Sweepstakes: $34,096.50. BE GRATEFUL To WIN,.. Win IT All, PLEASE.